It took a while but I finally got around to editing all my K2 video clips from our 2014 summit climb into one short (33 minute) video. As regular readers remember, all my climbs are to raise awareness and research funds for Alzheimer’s Disease. I became the oldest American at age 58 and the 18th American to summit K2. We summited on my birthday July 27, 2014. The video starts with our arrival in Islamabad, then the journey via planes, and FJ Cruiser’s to the “end of the road” at Askole where the 80-mile trek to K2 Base Camp begins. Hiking over the Baltoro Glacier is an adventure in its own right. Once at Base Camp, we visit the Gilky Memorial to remember those who have died in these mountains. 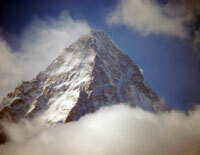 The climb on K2 begins at Advance Base Camp with a steep 1,000-meter (3,000 ft) climb to Camp 1. After acclimatization rotations as high as C2, the summit push begins near the end of July. I hope you enjoy the video and remember and continue to support the cause to find a cure for Alzheimer’s Disease. Really enjoyed watching the video Alan, even though my heart was in my mouth looking up to and through the Chimney!!! Jeez…..you are made of tough stuff. Thanks Alan! It captured the moments…I was stressing out just viewing. What camera (and editing program) did you use for the video? I am in the market for a lightweight camera after tiring of removing my gloves for an iphone, any thoughts? I made the movie using Apple’s free iMovie app. I don’t use my iPhone for expeditions due to battery life but more for a lack of a decent optical zoom beyond 2X. AMAZING video! Thank you for taking us there and filming all the different aspect you did! Congratulations! Thank you!!!!!! You’re the best!!!!!!! Hi Alan, Great video. I love following your blog & your Everest & K2 season posts. I was just wondering if you could give us an update on your recovery progress & if you’ve managed to make any climbing plans for the future yet? Will you be returning to the Himalaya or is it too soon to make those kind of plans? Would love to hear from you. Thanks James. I’m doing well. Yes, I have some plans and will post about them soon. Thanks for asking, means a lot to me. Impressive video and comments, Alan. Thank you for sharing. Tremendous effort for all. Congratulations to you and your team. Thank you Mary for taking time to comment. amazing… shows so much in a half hour….